Affirmative action originated as a plan to correct the historical disadvantage of women and people of color-to make the system more fair. Yet, for over twenty years, it has been repeatedly attacked for being unfair to whites, and even un-American. 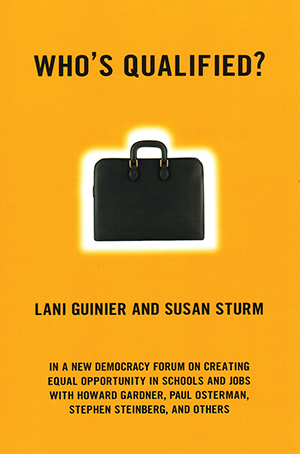 Guinier and Sturm begin with a critique of affirmative action as it stands now, arguing that a system of selection that determines ’qualification’ from test scores and then adds on factors like race and gender doesn’t work-either for the people it includes or the people it leaves out. But they go further, asking us to rethink how we evaluate merit. Marshaling lively examples from education and the workplace, they expose the failure of tests to predict success. They provide evidence that people’s success depends on the opportunities they have to perform, and that institutions do best when they are open to unanticipated contributions. Offering a model of selection based on performance, not prediction, the authors’ reconception of an old ideal suggests at once a smart business practice and a step toward the promise of democratic opportunity. Paul Osterman, Stephen Steinberg, Peter Sacks, and others respond.